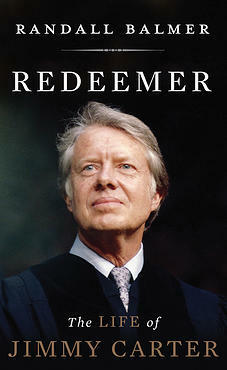 Randall Balmer's "Redeemer: The Life of Jimmy Carter"
James Earl Carter Junior is better known to the world as Jimmy and to the nation as our 39th president. Other images appear in our minds as well: a one-time peanut farmer, the man who struggled during his time in the White House and after his presidency, and a humanitarian and global peace maker. But in a new book, Dartmouth professor Randall Balmer takes a new look at Carter., who he says ‘was capitulated to the nation’s highest office by an electorate weary of political corruption, and enamored, however briefly of Carter’s evangelical rectitude.” But many who supported Carter’s religious-toned politics would eventually betray him and lead to his political demise. But Balmer shows how Carter rose again from the ashes this time as a citizen, devoting himself to humanitarian causes and eventually finding his personal redemption. Randall Balmer - historian and religion professor at Dartmouth College. He has published widely both in scholarly journals and the popular press, including more than a dozen books, most recently "Redeemer: The Life of Jimmy Carter."